We are a leading Manufacturer of pipe pandal and parda frill tent from Jaipur, India. 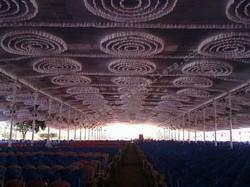 We are proud to present an extensive an exclusive assortment of beautifully designed Pipe PandalCeiling Tents. These tents are available in various sizes, shapes and design as per the requirements of our esteemed clients. We made these tents using finest quality fabric materials in accordance with the latest fashionable trends. Our valued clients can accessible from us these tents at most economical prices. We are manufacturer of sidewall with good good quality, wide range,attractive and latest designs. Sidewall/parda is mostly use for covering besides of the event. Our sidewall make your event graceful and beautiful. 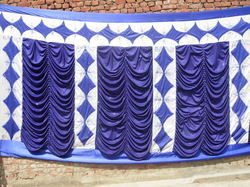 We can manufacturer sidewall is any size in single and double cloths as per your specification and choice.